The G.C. 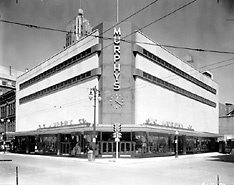 Murphy Co. store at Calhoun and Wayne streets is one of the last of downtown Fort Wayne's department stores still doing business. The store has been at its present corner location since Oct. 25, 1950, but these pictures give an interesting glimpse into the store's operation about two decades earlier. 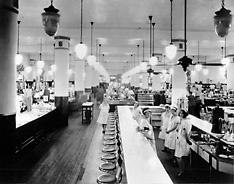 The interior photograph shows a department store of the late 1920s equipped with wooden floors, ornate lights and ceiling fans. Soda fountain attendants in Roaring Twenties outfits await customers behind their immaculate counter. To make room for today's store, the old Order of Oddfellows building at Wayne and Calhoun was razed. 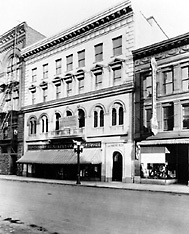 The building had also been the home of the Fort Wayne Commercial Club, forerunner of today's Fort Wayne Chamber of Commerce. (Editor's note, 1997: The G.C. Murphy Co. closed its doors Jan. 31, 1992.